Pleora will be showcasing its portfolio of video interfaces at booth 5533, including its new GigE Vision over Nbase-T embedded video interface platform. 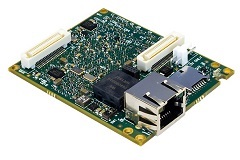 The Iport NTx-NBT video interface helps manufacturers meet increasing bandwidth demands for advanced imaging applications while achieving significant cost and design advantages. The video interface transmits uncompressed GigE Vision-compliant images at speeds up to 5Gb/s over extended-reach, inexpensive Cat 5e cabling. Integrated support for the IEEE 1588 Precision Time Protocol is included to synchronise image capture and imaging system elements, while an onboard programmable logic controller lets users control external machines, make functional changes, adjust timing, or add features without requiring new hardware. Customers are now designing Pleora’s GigE Vision over Nbase-T embedded hardware into x-ray flat panel detectors, cameras, and other imaging devices.